1 When the day of Pentecost had come, they were all together in one place. 2 And suddenly there came from heaven a noise like a violent rushing wind, and it filled the whole house where they were sitting 3 And there appeared to them tongues as of fire distributing themselves, and they rested on each one of them. 4 And they were all filled with the Holy Spirit and began to speak with other tongues, as the Spirit was giving them utterance. 5 Now there were Jews living in Jerusalem, devout men from every nation under heaven. 6 And when this sound occurred, the crowd came together, and were bewildered because each one of them was hearing them speak in his own language. 7 They were amazed and astonished, saying, "Why, are not all these who are speaking Galileans? 8 "And how is it that we each hear them in our own language to which we were born? 9 "Parthians and Medes and Elamites, and residents of Mesopotamia, Judea and Cappadocia, Pontus and Asia, 10 Phrygia and Pamphylia, Egypt and the districts of Libya around Cyrene, and visitors from Rome, both Jews and proselytes, 11 Cretans and Arabs--we hear them in our own tongues speaking of the mighty deeds of God." Before I even say anything about this passage, I just want to make you aware of the fact that I am not without experience, concerning the gift of the Holy Ghost we are speaking about here. I only mention this so that nobody will think that I stand here as a “dry” Lutheran, without experience, one who only has half of the Gospel, who some people say about us. There are enough of them - and today more than ever - who claims to have the Spirit more than others. It is pure pride that is showing, and we should not put up with that, but thank God for what His Word teaches us, exactly that whoever has Jesus, has everything. Everything that he “needs for heaven and earth.” The Father gave you everything when He gave you Jesus! – Do not let anybody limit this gift for you, so that you think you must have something else or more. Just be open for the gifts of the Spirit He will equip you with. And do not be like those who say: No, I cannot do that or that. No, there is no one of us who can do anything, when it comes to the Kingdom of God, but He can! As we read earlier: “And they were all filled with the Holy Spirit and began to speak with other tongues, as the Spirit was giving them utterance.” (v.4). Yes, as the Spirit was giving them utterance! We also read this in a testimony about the gifts of the Spirit from Paul - he has mentioned certain gifts of the Spirit and then he writes further: “But one and the same Spirit works all these things, distributing to each one individually just as He wills. For even as the body is one and yet has many members, and all the members of the body, though they are many, are one body, so also is Christ.” (1 Cor. 12:11-12). Yes the body is a good picture for that, one limb cannot usually do another limbs work! We do not need to go into detail with this I should think, it is pretty obvious. Even as obvious concerning the gifts of the Spirit, but we mess it up, by our flesh. We would rather have something extraordinary for ourselves to be seen. Jesus speaks about the greatest in His kingdom, which is the least! – If you really are going to make a “career” in the kingdom of God, you have to become one of the least. Would you like that? Would you like to be one of those who are not visible at all? You probably feel that it is shrinking up inside just by thinking about it! But you and I are not capable to carry any gift of the Spirit the right way, if we are not of the right mind; that is the case. The gift of the Spirit that is especially mentioned here is not meant to be shown on stage with shouting, so that everybody can see how spiritual you have become. It has a totally different purpose, which all of the other gifts has, exactly to build God’s kingdom; - something you and I are not able to do with anything in ourselves. It is something God alone can do, and He uses people in His favor. - But then again, we are not able to do anything in ourselves. That is why He has given us His Spirit, to keep and edify us as believers, and to serve each other, and to spread the Kingdom of God. It is in this context you have to see this gift of the Spirit, which is shown so clearly in this passage. “And when this sound occurred, the crowd came together, and were bewildered because each one of them was hearing them speak in his own language!” And how is it that we each hear them in our own language!” (Acts 2:6). This was the purpose - that they should hear about God’s great wonder in their own language. And the wonder for them consisted of the fact that there were Galilean men who spoke it; - it had to be a gift of the Spirit! – There and then. We must not be strangers to the fact, that God is the God of wonders. Maybe we to often start off with our own assumptions, because we - as the disciples had - have so little faith! Jesus also gives us a great comfort in this, that we see that He helps them, despite that He complains their lack of faith. But we should notice that He complains over lack of faith. It is not a goal for us - walking around lacking faith. It is such a blessing with this kingdom, where you get everything merely by grace! Have your eyes been opened to this? No, maybe you are too busy looking at yourself, your abilities and possibilities! But that is not why the Spirit was outpoured on Pentecost, so that you could bet on your own abilities and possibilities! How far can you go there? No, the Spirit was outpoured, exactly so that we could look away from our own, and count on Him. We are not exactly good at that, are we? Therefore we have to thank even more that we can find ourselves in the grace, and not the kingdom of laws. The Father is satisfied with Jesus, it is what the Spirit has come to teach, everyone in his own or her own language. A short speech of Peter on the Day of Pentecost: "Brethren, I may confidently say to you regarding the patriarch David that he both died and was buried, and his tomb is with us to this day. "And so, because he was a prophet and knew that GOD HAD SWORN TO HIM WITH AN OATH TO SEAT one OF HIS DESCENDANTS ON HIS THRONE, he looked ahead and spoke of the resurrection of the Christ, that HE WAS NEITHER ABANDONED TO HADES, NOR DID His flesh SUFFER DECAY. "This Jesus God raised up again, to which we are all witnesses. "Therefore having been exalted to the right hand of God, and having received from the Father the promise of the Holy Spirit, He has poured forth this which you both see and hear. "For it was not David who ascended into heaven, but he himself says: 'THE LORD SAID TO MY LORD,"SIT AT MY RIGHT HAND, UNTIL I MAKE YOUR ENEMIES A FOOTSTOOL FOR YOUR FEET." 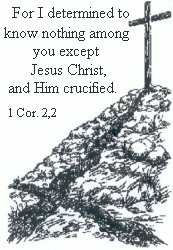 'Therefore let all the house of Israel know for certain that God has made Him both Lord and Christ--this Jesus whom you crucified." (Acts 2.29-36). Do you see that it is Jesus who gives The Holy Spirit, His Spirit, to whom He wants; - you shall not seek the Spirit in a certain way, but you shall seek Jesus, where He is revealed, in the Word, then you shall receive the Spirit, and everything else that you need. But listen, - not to become anything special in your own eyes or anybody else’s eyes, but to be preserved by Him, and capable to serve others. We have this sad tendency to seek the extraordinary; it gives us a buss, the mystical and odd. Like an old bible teacher expresses: Only a strange animal pulls people to the market place, - but how many are interested to hear about sin and grace? – About God’s salvation? – About Jesus Christ’ sacrifice and love? Paul was busy as you can see, by what which really profited the kingdom of God, God’s case, and not what was evidently extraordinary, - on account of that he puts speaking in tongues way down, and not out there visible, as we so often see examples on. I want to recommend you to grab a bible word book and look up the word: tongues. Even though he do not put this as the first and foremost gift of them all, as many of us do, he does not put aside, which some of us do, but he is rather thanking God for speaking more in tongues than any of them! Everything I have quoted now you can read about in 1 Cor. 14. What this wonder on the Day of Pentecost has to point out for us, is that we have a Father in heaven, who has not spared anything, so that exactly you should hear the Gospel being preached! – So that you would hear about your savior in your own language! It is the Spirit’s first and foremost deed, - to preach and glorify Jesus, so that you can start believing and get saved! That has happened has it not? You could say: “Praise God, He is mine!” Or else you got to draw near unto Him, in this moment of time. He who did not spare anything, not even His own life, to bring you salvation, he would like to hear you, when you call! – Yes, He hears before you call! It is also Him who works the call, by His Spirit and by His word. Therefore we shall thank the outpouring of the Spirit; - Because He has come to testify of Jesus for us, so that we can take part in Him. It is not possible by pure knowledge; the testimony of the Spirit has to come. Let us pray that it must happen to all of us, and all of our closest, and all who God calls, exactly on this day, when we hear this mighty testimony about what God has done; - He has sent us His Spirit! – His hand is not too short to save us! (Is. 50:2; 59:1).